Spirit of the Blank: [Faith Corps] Hey, Star Wars! 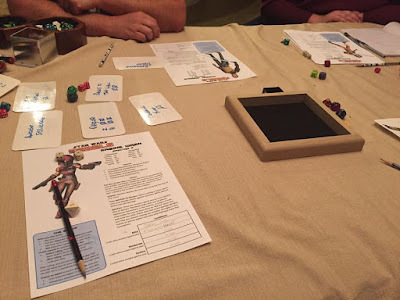 Event pre-reg for this year's installment of Gamex opens tomorrow at noon, and one of the games I'll be running there is a highly anticipated (by me) Faith Corps treatment of Star Wars Rebels. Your first question may be, "Mike, what're you, some kinda bag of hammers? How could you misspell 'Fate Core' so completely?" Fair question. Rude, but fair. Twist answer: I didn't! Faith Corps is the game system that powers the new edition of Demon Hunters: A Comedy of Terrors RPG. Designed by Cam Banks and Amanda Valentine -- maybe you've heard of them? -- it's mostly a blend of Fate Accelerated Edition and Cortex Plus with a little Atomic Robo thrown in. I've used it for a couple of Star Wars games at conventions since last fall, and I'm really digging it. The mechanics are pretty similar to Cortex Plus, with plenty of room to play around with different dice tricks, but it plays almost identically to Fate, so it's been very intuitive for me. (And, y'know, just different enough to trip me up sometimes.) And since it's that close to Fate, well, I figure talking about it on this blog is fair game. Anyway, last fall I ran a Faith Corps Star Wars game called Rebel Scum in which the PCs were Imperial Intelligence in the nascent days of the Alliance to the Restore the Republic. They were tasked with infiltrating a Rebel cell and finding out what they could about the Alliance's plans. What they ended up doing was assassinating Mon Mothma, framing someone else for it (right before convincing a group of Rebels to space him), and assuming leadership of the Rebellion. Take that, canon! I followed that up in February She-Devils of the Outer Rim, a mash-up of volume 7 of Atomic Robo with a bunch of EU stuff I'd never heard of before I found it on Wookieepedia. Given the source material, I'd expected and planned for a whole lotta dogfighting -- came up with some simple dogfighting rules and wrote up a bunch of ships, using WEG Star Wars and the X-Wing minis games as general guides -- but they didn't really end up doing much. Point is, I have a set of good, workable, easy dogfighting rules. Plus sweet Star Wars-ized portraits of four She-Devils from Robo, courtesy of Scott Wegener. At the end of the month, at Gamex, I'll be running this Star Wars Rebels scenario. It's the first time I've really statted up canon Star Wars characters of any kind, let alone such fairly well-known ones, so the pressure's kind of on (in my mind). I managed a playtest of most of it last night with four local gamer-friends, and it went well, so I'm looking forward to the real thing. I'm trying to blend elements from a few different eras of the Star Wars saga; we'll see if it's too much. Of course, by then it'll be too late, but whatever. Come play it anyway!